(M) Vintage Mens 70s Disco Shirt! A Village by the River in a Soft Neutral Palette! 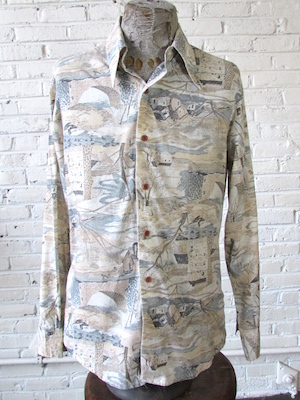 Home > Men's Vintage Shirts > All Men's Vintage Shirts > (M) Vintage Mens 70s Disco Shirt! A Village by the River in a Soft Neutral Palette! Mens vintage 1970s disco shirt. 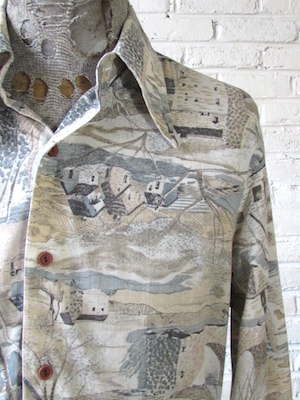 This funky vintage disco shirt has an all over print of quaint little village filled with houses and a bridge by a river. The pattern is done in a soft neutral palette of tan, brown, cream, and a grayish-blue. Has a super wide & pointy disco era collar. Closes in the front with sienna colored plastic buttons with one matching buttons on each cuff. Shirt has a tapered hem. Tagged by Kennington. No material tag, but feels like a cotton blend.